What do you get when you combine delicious wine, local food, and one of the world’s longest pedestrian bridges? A premier food and wine tasting event that takes place on the Walnut Street Bridge right over the Tennessee River! In 2018, the 24th annual Wine Over Water Food & Wine Festival returns for a 4-day festival filled with incredible food, brewery tours, yoga brunch, and, of course, lots of wine. The festival takes place Oct. 4-7, 2018, and highlights Chattanooga’s growing culinary scene. The main event is Saturday, Oct. 6, from 5-8 p.m., where you can taste more than 100 wines from around the world, listen to live music, and sample food from 16 local restaurants. 7-10 p.m. – WOW Weekend Kick-off Party: Get the weekend started with champagne from Moët, live music from The Million Dolla Man, a live auction, and delicious food prepared by Chef Erik Niel of Easy Bistro & Bar. Get tickets here. 7-11 p.m. – MLK Beer & Bites: Hop between Bitter Alibi, Oddstory Brewing Company, 2 Sons Kitchen, and Hutton & Smith for special beer and food offerings. Brewery tours at Oddstory will be offered every hour. Get tickets here. 5:30-8 p.m. – Best Cellars:The exclusive Best Cellars premium wine-tasting event will be held at The Westin Chattanooga and will feature more than 150 different premium wines, a silent auction, and live jazz music from Robert Crabtree. Get tickets here. 11 a.m.-3 p.m. – Lunch Botanical at The Dwell Hotel: Find your place in the sun before a full evening on fun at Wine Over Water! Enjoy a botanical themed lunch complete with food and cocktails that will feature herbs, flowers, fruits, and rosés at The Dwell Hotel&apos;s Solarium Cafe. Get tickets here. 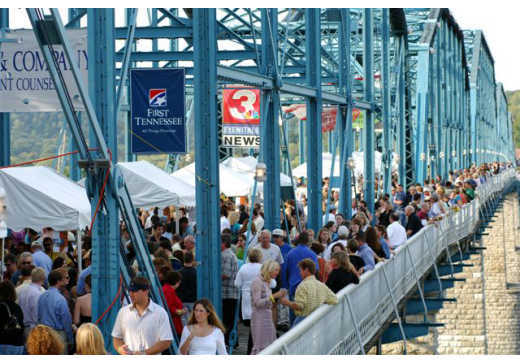 5-8 p.m. – 24th Annual Wine Over Water Food & Wine Festival: Enjoy hundreds of wines, food from more than a dozen local restaurants, and live music as you stroll along the Walnut Street Bridge on a beautiful fall evening over the Tennessee River. Get tickets here. 6 p.m. – Wine Dinner at St. John&apos;s Restaurant: Enjoy an exquisite five course dinner prepared and paired with Orin Swift Wines by Executive Chef Rebecca Barron and Sommelier Michelle Richards. Enjoy the quality, ambiance, and attention to detail St. John&apos;s graciously offers. Get tickets here. 10 a.m.-1 p.m. – Yoga Brunch at FEED Table & Co: The perfect cure to a libations-filled weekend is a yoga class – with more libations! Join Two of Chattanooga’s favorite yoga teachers, Sara Mingus of Southern Soul Yoga and Kyle House of Kyle House Fitness, for a relaxing yoga session followed by a scrumptious brunch and, of course, lots of champagne! Get tickets here. 4-7 p.m. – Sunday Supper at The Daily Ration: This is a Sunday Supper that might even be right up there with your grandmother&apos;s! Start with a craft cocktail from Chattanooga Whiskey followed by a family style dinner prepared by Chef Jason Bowers. It’s the perfect way to wrap up a wonderful wine-filled weekend. Get tickets here. All proceeds from ticket sales benefit Cornerstones, Inc. and their historic preservation efforts in Chattanooga. Tickets to all events can be purchased at Wine Over Water.